Market Table has been on my list of places to try ever since I ventured to their sister restaurant, The Little Owl. And since Owl had been such a hit, I expected the food at Market Table to also be exceptional. My co-workers and friends, Leann, Jackie and I ventured there during lunch and had the most pleasant experience. Similarly to The Little Owl, Market Table is simple, rustic yet elegant. I like that it's unassuming from the outside but very cool and unpretentious on the inside. The space is divided into two rooms--the front-of-the-house shop and the back dining room. That's where we sat and it was spacious, modern and well-lit, surrounded by huge windows on all sides. I like that all tables have rustic wooden chopping-block tops. You feel like any minute someone will come by and put a huge piece of bread on it for you to cut and enjoy. Since we went for lunch, it wasn't too busy but I heard that getting a dinner reservation is nearly impossible. That's why I'd suggest doing what we did--and the same goes for The Little Owl. The menu is small and we were happy about that, as it made our choices easy. Our selections ran the gamut, as I had soup, Leann got a sandwich and Jackie went for scallops. Overall, we were super pleased and would gladly go back. 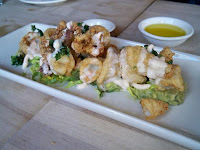 Crispy Calamari - While I wouldn't usually order this for lunch, it caught Jackie's eye and in the end I was glad. It had the most exquisite crunchy crust that I think was made with cornmeal. There was guacamole on it too, which is so different from the norm. It worked beautifully, as the creamy guac soothed the spicy flavor of the chili crema, which was interlaced into the calamari crevices. 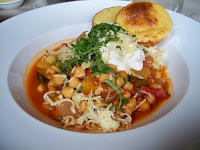 Vegetable Chili - I was in the mood for a warm hearty soup and that's pretty much what I got minus the broth. Loving the chunkiness of the soup, I devoured the pieces of tomato, onions and chick peas. The ultimate piece-de-resistance was the corn bread, which made up for the lack of broth in my bowl. Fluffy, sweet and at the same time savory, it provided a tasty mop for what juices there were and I loved putting the veggies on top of it. So yummy and filling too! 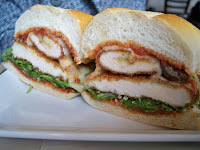 Crispy Chicken Cutlet Sandwich - Leann ordered this and it was mighty impressive, not only because of its massive size but also due to its combination of clean flavors. The chicken was cooked perfectly and it remained nice and juicy, while the arugula added a spicy pepperiness and the provologne mellowed things out. It was so large that Leann had trouble finishing it, especially because of the sea of dark, crispy kettle chips that surrounded her plate. 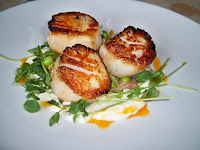 Seared Diver Scallops - Jackie chose the scallops, which wasn't surprising, as she's a known crustacean lover. Having high hopes, Jackie's expectations were met, as she enjoyed these gorgeously golden nuggets of goodness, dressed with peas, creme fraiche and chili oil. I tasted a scallop and liked it but I wouldn't call it spectacular. Toward the end of her meal, Jackie discovered that one of her scallops was not all the way cooked through, which was sort of disturbing, preventing her from finishing it. I'd recommend skipping this option and going for something more simple and traditional. Hush Puppies - Who doesn't love fried corn bread? We certainly do and were super psyched to have it as our side dish with clover honey butter as an embellishment. How delicious! Each piece was crispy on the outside and so sweet and buttery on the inside. Once dipped into the honey butter, it was even richer and each mouthful provided a sweet-savory decadence. Our waitress was friendly and laid-back. We didn't feel pressured to leave and because the restaurant wasn't crowded, we took our time with the check and chatted a bit. Everything was brought out in good time and we didn't have any complaints whatsoever. Market Table is a definite splurge and that's another reason why we went there for lunch rather than dinner. Appetizers during lunch range between $9-14, entrees are $14-$19 and sides run between $7-$11. The entire lunch cost us $24 per person with tax and tip.